Whether you’re covering a concrete surface in tile or carpeting or replacing a broken slab, measuring the concrete is an important first step. For a surface project, you’ll only need the area of the slab, but for slab repair or replacement, you'll need the volume. Since concrete is sold and mixed by cubic yards, you'll need to use the same unit of measurement, converting units along the way as necessary. Use a measuring tape to measure the length and width of the concrete slab in feet. Round to the nearest foot. Dig alongside the slab until you reach the bottom and measure the height of the slab in inches, rounding to the nearest inch. Record your measurements. If you need to replace only part of the slab, measure only the length, width, and height of the section. Convert the slab height to yards by dividing it by 36. Calculate the area of the slab by multiplying the length by the width. Then multiply by 0.111 to calculate the area in square yards. 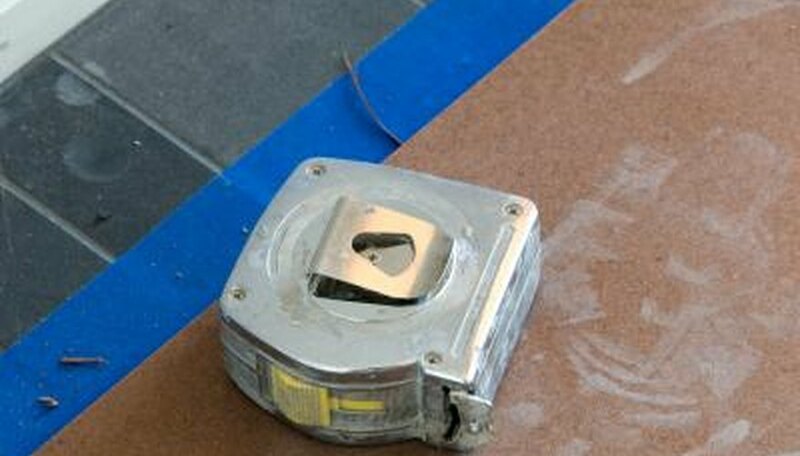 Use the area when determining the amount of material (e.g., tile or paint) necessary to cover the surface. Multiply the area in square yards by the slab height in yards to calculate the volume of the slab in cubic yards. The cubic yardage is necessary when determining the amount of concrete used to create all or part of the slab.